Please add your suggestions for using [cpkws_post_attr field="title"] in the comments below... thanks ! Why is this product not available to download? Never mind. I found them. Thanks! I use the Dolch words for our classroom word wall. I print them on different coloured cardstock. The students add the words to the word wall as they are introduced. 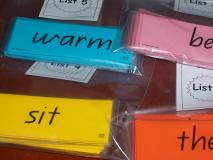 I also go through sight word flashcards every day as part of our routine. I don’t do all the words, just the ones we are focusing on. I read out a sight word to the class, e.g. ‘said’ and ask them to spell it on their mini whiteboard, then I show them the word and ask them to check their spelling of the word.